I always keep an eye out for him when shopping in Horsham. I last saw him at the Coleridge B re-union a few years ago. Lost his sharp wit ? NEVER ! I think the disputed photo must Summer 1977. I left in 1976 so recognise many names and many faces. Best wishes to all, and to Bob Rae especially. Mid A 15 wrote: Agree with Campbell. I think the chap next to him might be Nigel Hutchins. 2nd from right back row might be David Hemy. Nigel Wood will be there somewhere. An excellent hockey player as I recall. He had very blond hair but my eyesight and memory are not good enough to find him. He could seated 2nd from right. John Pickering will be there but, unless I've miscounted your numbering system, I'd say he is the taller chap next to the one you've said is possibly him. To the right as we look at it. If it is 1971 then I would expect to see a pair of Wansey twins but again I cannot recognise them. Could be my eyes and memory though! AKAP or Howard H might recognise a few. More than 4 years on I've looked at this again and I think the Wanseys are in fact C2 and C3. Don't ask me which is which though my eyesight isn't up to it! I could distinguish them in the flesh though when we were at CH. Jonathan was my nursemaid which helped! On a sad note at least two included in this photo, Cooper and Hemy, are no longer with us. Just discovered this in my attic. I believe it to have been taken in 1953, but could be out by a year either way. The House Captain is Ian Pitter, which should enable someone to be more precise. David Taplin has an astonishing memory. On the far right in front row is, I think, Coare. What a memory. I think far right front row is Coare. The "X" in the back row next to Stewart is my brother Richard Wells (known as "Bodge" to the "Uncle" Kirby group). He left in 1952 to join the Merchant Navy (note the RMS plate on his left shoulder) after a course at the Outward Bound School so the photo is not 1953. The "X" next to him is "Bunny" Burnside. I was in Maine B at the time thus avoiding the presence of four bods by the name of Wells in the same place at the same time. The other two Wells in the photo were brothers I believe. I thought it couldn't be 1953, because Hines was SG in 1957, and Thomas in 1958, and both look too young to have got that far so quickly. Thornton B had 'four bods with the name of' Snow (which was sometimes confusing). One was the famous cricketer John, who was not related to the other three, who were brothers, two of them (non-identical) twins with the same initial. For what it's worth: In the 1975/76 photo (or is it 1977?) 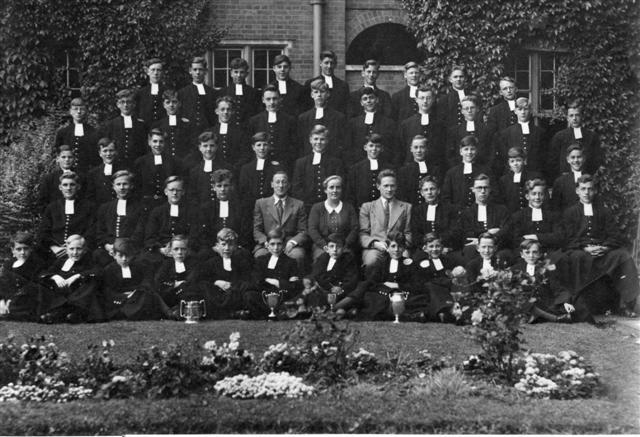 posted by 5h17shoveller, the lad on far right of the second row down (next to Colin Eley) was named Will Wyatt. As for Steve Bartlett, I can remember right back to when he was called Steve Barrett. Hounslow's answer to Paul Weller, he was. The inventor of the first time travel apparatus. And he was, at one time, on the short-list to be the next Dr. Who !